So I am a big fan of Hungry Girl. I have a few of her recipe books and I get her almost daily emails. I have discovered a lot of delicious swaps for foods and ingredients that might be less than healthy for you through Hungry Girl. 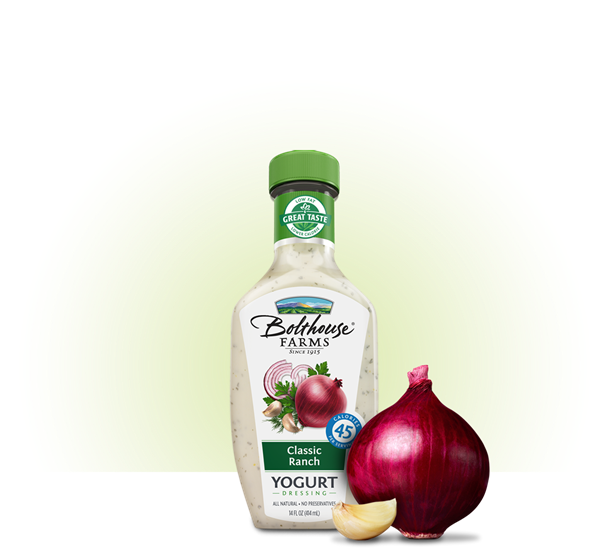 My latest, and probably BEST discovery, are the Bolthouse Farms Yogurt Dressings. I am a huge creamy dressing fan. I love Caesar salad and house salads with ranch. I love dipping my pizza in ranch dressing. The problem is that those oh-so-good, oh-so-creamy dressings are usually loaded with fat, sodium and calories! They can turn what was already a healthy choice (leafy green salad with veggies and packed with good-for-your proteins like chicken or tuna) into a big, unhealthy mess. So when I read Hungry Girl’s recommendation for us creamy dressing lovers to try the Bolthouse Farms versions, I ran to the store! Good thing I live right around the corner from a Meijer… literally. I picked up two varieties: Caesar Parmigiano and Salsa Ranch. I had really wanted to try the Classic Ranch, but they didn’t have it at the time when I went to buy them. I don’t think my Meijer stocks all of the varieties all the time, because when I went shopping again the other day, they did have the Classic Ranch but didn’t have the Salsa Ranch! So here’s the stats: These dressings are made from yogurt, but tasting them you’d never believe it. They have REAL ingredients… aka, the average person can not only pronounce but recognize all of the ingredients in the dressing. A 2 tbsp serving has 35-45 calories and 1.5-3g of fat. And the Caesar Parmigiano legitimately has CHEESE in it. Seriously! You’re thinking… something like that cannot possibly taste good. We’ve all tasted light and fat free dressings, and I think we can all agree that they just don’t taste as good as the original. But oh, they do taste good. So good in fact that I’m seriously contemplating sneaking them into my purse the next time I eat out to put on my salad instead of the dressings at a restaurant. So good that I actually REALLY prefer them over those fatty dressings. There are a few downfalls to these dressings, but they definitely aren’t deal-breakers in my opinon. They are more expensive than your traditional dressings, but the flavor and the nutritional value of this product in my opinion is worth the extra cost! Just be mindful of the expiration dates so it doesn’t go to waste. I’m totally loving these dressings and I think my next purchase is going to be 2 oz souffle cups that I can fill up and sneak into restaurants with me so I can enjoy them on the go!! !